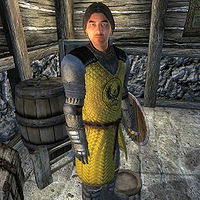 Carius Runellius is an Imperial guard, and a member of the Bruma City Watch. He is the chief investigator during the quest A Brotherhood Betrayed. Carius is convinced Bradon Lirrian is a vampire, and thinks Erline is in denial. Carius starts out inside the Lirrians' house, and patrols the area 24 hours a day. When you show him Gelebourne's Journal he will rush out of the house and, after an hour, show up at Olav's Tap and Tack, waiting for the player to arrive. After the quest, he will settle down into a usual daily routine. He sleeps from midnight to 7am in Bruma Castle Barracks. He spends his day patrolling the northeastern part of the Great Hall and at 11am he takes a two-hour lunch break inside the barracks. As a guard, he wears the usual chainmail boots, gauntlets and greaves along with the Bruma cuirass and shield, and wields a silver longsword. He is one of the few people with random lower class clothing, and also carries a small amount of gold. The two keys he carries, a Castle Bruma key and a Castle Bruma Interior key, allow him access to Castle Bruma. When you first encounter him in Bradon Lirrian's House, he will ask you to leave (though you're not trespassing): "You're going to have to leave. This is a crime scene and no one other than ourselves or Raynil Dralas will be allowed access." If you ask about the investigation when he has a disposition below 70, he won't provide any details: "The culprit in this crime has already been dealt with. It's just a matter of wrapping up the details. I'd tell you more, but frankly, I don't know who you are, so I'm not sure that I can trust you with that sort of information." However, with a disposition higher than 70, he will tell you what happened: "I suppose there's no harm in telling you what happened. Word is bound to get around Bruma anyway. Turns out that Bradon Lirrian is a vampire. Or was. If it wasn't for Raynil Dralas, we may never have uncovered the truth. Let me explain. In the last week or so, we've found two bodies stashed in shallow graves outside the city walls. The bodies had puncture wounds on their necks. The bodies were those of some beggars who used to wander the streets looking for handouts. Vampire probably thought no one would miss them. Luckily for us, Raynil arrived in town. He said he was a vampire hunter, so we asked for his help. He tracked the vampire to this house. When he entered the place around noon, Bradon was sleeping. He was able to slay him at that point. Luckily, Bradon's wife wasn't home. Poor thing, she didn't even know her husband was infected. We did a follow up investigation, and it's true that no one recollects seeing Bradon out in the daylight. He's only been spotted at night. I'm afraid there's not much more to tell you. So, you can see we really don't need any help. But thanks for the offer." After you've agreed to help out Erline, he won't be very supportive: "I'll warn you about one thing. I understand you wanting to help Erline by checking up on Raynil. We have it on good authority from officials in a neighboring city that Raynil is what he says he is. So I'm not sure what you're trying to prove. I'm only allowing you to do this investigation, and I use that term very loosely, because Erline is so distraught." When you find Gelebourne's Journal, you can ask about him: "How'd you know about that? Agh... too many people don't know how to keep quiet about official matters. Very well. The Skingrad city watch informed us that Gelebourne was killed by Raynil not too long ago. Gelebourne was a vampire as well, obviously." Confronting him with the journal, he will be shocked: "I... I don't know what to say. It all makes perfect sense now. Why else would Raynil have removed this journal from the crime scene in Skingrad? I heard no mention of a key either. It must have been removed by Raynil from Bradon's body before we arrived. To think that two innocent men were killed, and that I'm responsible for one of their deaths... I... I'm speechless." He will show further disgust towards Raynil after you've unfolded the truth: "I can't wait to get my hands on Raynil. He'll become very familiar with Bruma's dungeons; or the end of my blade if he doesn't come peacefully." After you've finished the quest, he will be pleased with Raynil's death: "You did what had to be done. There should be no regrets or doubts in your mind about it. Raynil was an evil Dunmer, and he deserved that fate." From that point on, upon ending every conversation with him, he will jokingly suggest you to join the guard faction: "Have you ever considered a job in law enforcement? Hehehe."